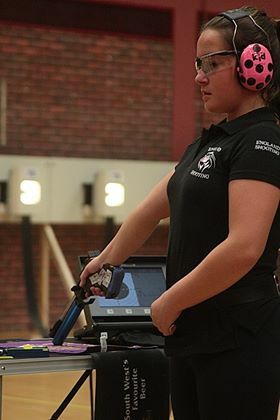 PLYMOUTH College pupil Emily Pascoe impressed at the recent British Schools’ Shooting Championships held at the Stoke Mandeville Stadium in Aylesbury. The Year 9 student finished fourth overall in the intermediate girls’ competition. The finals brought together students from all over the UK following five qualification events around the country. The competition at Stoke Mandeville involved a qualifying round that reduced the 32 finalists to an elite eight for an Olympic format knock-out shoot-off. Pascoe, in her first year at intermediate level, qualified easily into the finals in third place and was only four points behind the eventual winner. She upped her game again in the finals finishing the highest placed Year 9 competitor and fourth overall. The youngster was recently selected to shoot as part of the British Shooting Pistol Squad (Under-21) and trains at the ESSU Academy in Bisley with her precision coach and Olympic pistol shooter Margaret Thomas. 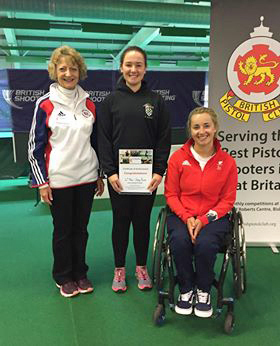 She is pictured (top) with Thomas and Great Britain Paralympic pistol shooter Issy Bailey at British Championships.